Chinese e-commerce giant Alibaba has beaten market expectations with a huge jump in quarterly revenues fuelled by online shopping. Revenues for the three months to September rose 61% on the same period a year earlier, to 55.1bn yuan ($8.3bn; £6.4bn). It also raised its revenue predictions for the full-year forecast. 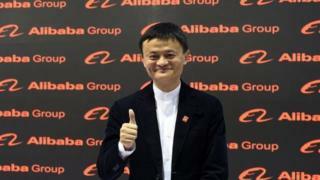 Alibaba is expanding from its core online businesses to investments in supermarkets and stores. "We had an outstanding quarter," Alibaba chief executive Daniel Zhang said in a statement. "We are seeing the early results from our efforts to integrate online and offline with our new retail strategy". For the July to September quarter, income from operations surged 83% from a year earlier, to 16.58bn yuan. Alibaba, started by billionaire Jack Ma, is the dominant online retailer in China through its Tmall and Taobao shopping platforms. The company said mobile monthly active users of its Chinese retail marketplaces grew to 549m in September, up 20m from three months ago. The US-listed firm has been on a strong run, regularly beating revenue estimates, and its shares have more than doubled in value this year. It expects more good news for shareholders ahead: Alibaba raised its revenue guidance for the 2018 fiscal year to growth of between 49% and 53%. That's up from 45% to 49% previously forecast. The Chinese firm is also gearing up for the annual blockbuster Singles' Day event on November 11, a sales bonanza that moves more goods than the Black Friday and Cyber Monday sales days in the United States combined.